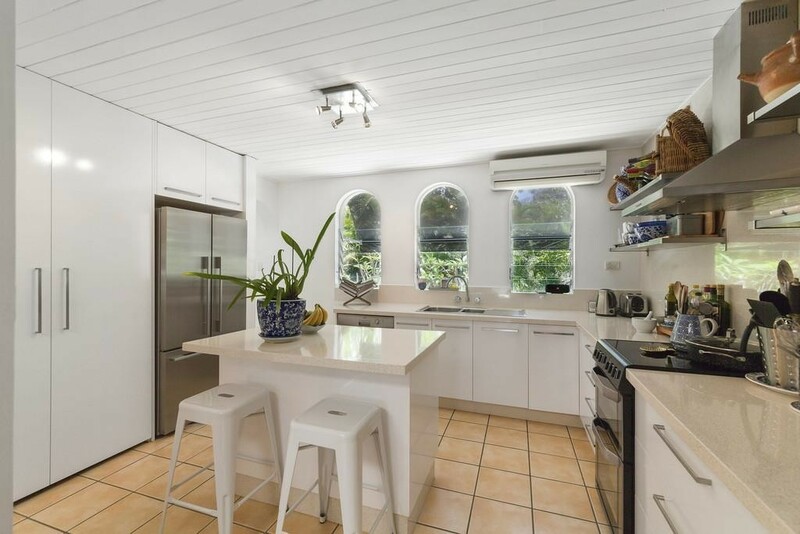 With infusions of Spain, this European bungalow is thoroughly charming inside and out and offers an enviable beach side life in a dress circle location just two minutes to the sand, and 2.5 kilometres to Peregian village which can be accessed by cycle and walking paths. All on one level for effortless maintenance and flow; the home is complete with four bedrooms, two bathrooms, contemporary kitchen, two living areas, east-facing covered patio overlooking in ground pool, sun-drenched winter courtyard at rear, and double lock up garage on a fully fenced 718m2 block. Presentation shines and there is a cool, chilled ambience exuded that is so calming and relaxing; features include easy-care tiled floors throughout, stone benches in kitchen, stainless steel appliances, island bench, skylights in lounge, wood combustion heater, split system air-conditioning, ceiling fans, patio access from master, generous storage, solar hot water, and solar power. Arches, decorative plaster ceilings, timber features, white-washed interiors and exteriors, all work in symmetry to truly boost its charm and character, reminiscent of those delightful homes of southern California that have timeless appeal. The front alfresco poolside area is extremely private with a rendered wall at front; framed by tropical vegetation and with minimal grass, the garden requires minimal maintenance to keep it looking so good! With a front and rear courtyard, you can relax alfresco in comfort and style in all seasons. Located on the eastern side of the David Low Way in a blue-chip Marcus street surrounded by premium lifestyle homes; you can walk to the sand and surf in approximately two minutes, if home is where the beach is, then this is certainly home! There is also a fabulous dog-beach within short walking distance for your furry companions to make new friends. Long-term owners have made a firm decision to sell, giving you the opportunity to secure a slice of a coveted beach location.